If you have a limited budget for groceries, you’re probably looking for ways that you can cut your spending and not have to sacrifice to much to do so. One way to save money on groceries is to cook from scratch from home. The problem with cooking from scratch is, many people think that it takes too much time and money to do so. The fact is, if you do it by meal prepping and batch cooking, it takes a lot less time than you think and you can save quite a bit of money in the process. Follow these tips on how to meal prep on a budget. They include frugal ways to shop for groceries and choose recipes. Choose meats that are in season. Did you know that meat has a season? It’s true! Just like produce meat has a season and that’s usually in the Spring or Fall, but depending on the type of meat, it can be other times as well. This is why you see chicken or beef at lower prices at certain times of the year, for example. It’s also why you should load up your freezer with extra turkey near the holidays. Most cuts of raw meat can last in the freezer for 6 months and whole chickens and turkeys can be frozen for up to a year. You can also batch cook your meat and then freeze it in usable portions. 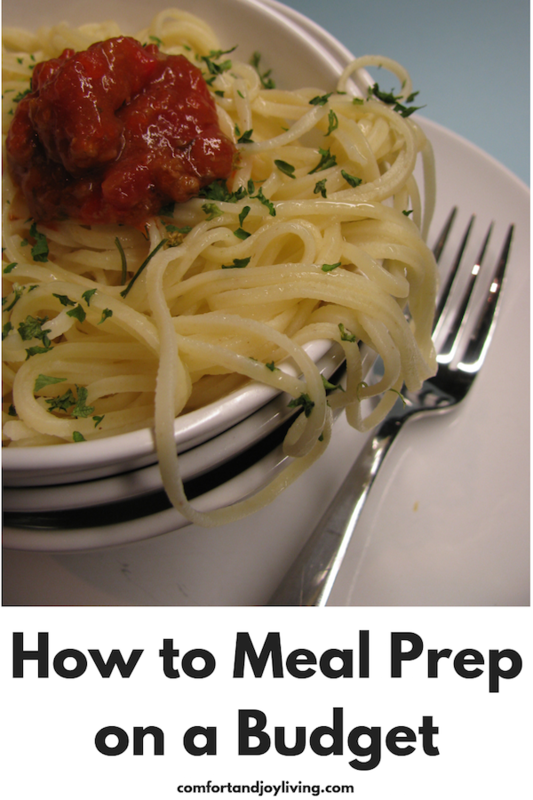 This will cut down on the amount of time it takes you to prepare meas on busy nights. Shop for in-season produce. This is probably something that you’re already doing, but shopping in-season for produce is extremely smart for your budget. And, when you shop for in-season produce, you can get a little help in deciding what to make because you just make recipes that use those ingredients. Additionally, you can freeze produce that’s already chopped and ready to go if you find an extra good sale for later meal planning. Go for low-cost grains. Grains are one of the cheapest categories of food you can buy and they’re exactly what you’ll need if you do meal prep dinner side dishes and lunch bowls. Even healthier grains like brown rice and quinoa are extremely reasonable in price when bought without any added seasonings and are perfect for building your meals as well as cooking in advance. Save even more by shopping for grains in the bulk food section. Buy in bulk whenever you can. Buy in bulk makes complete sense if you’ll be cooking large amounts at one time during meal prep.It also saves you a lot of money because you’re not paying or as much packaging—if at all—and you can get deals that are very cheap, allowing you to stretch your dollar even further. Then save time by meal prepping. Batch cook foods when you find them on sale and then freeze them for future use. This allows you to buy large quantities without having to worry about food spoilage. You can batch cook your meats and grains. And don’t forget that you can also batch cook breakfasts foods. The other benefit to batch cooking is that if you have precooked foods in the freezer, you can grab them on days when you’re too busy to cook, so you’re less likely to stop for fast food. Look for recipes that use low-cost ingredients. Once you have an idea of what ingredients you can afford, start looking for recipes that use those ingredients. You may even notice that many easy recipes call for low-cost ingredients, too. Buy what make sense for your budget and keep in mind that low cost and simple ingredients don’t mean bland meals. Seasonings and spices can really kick recipes up and they can be bought at great prices in bulk as well. What are your tips for meal prepping on a budget?